Some people are just born with more energy than others. No doubt Michael C. Tobias and Jane Gray Morrison are among them. How they manage to produce the volume of work they do is beyond me. In addition to serving as President and Executive Vice President respectively of the NGO, Dancing Star Foundation, which focuses on international biodiversity conservation, global environmental education, and animal protection, the couple has written over 50 books, and produced over 100 films. But it’s not just the volume of their body of work that’s amazing. It’s also the breadth of their knowledge and the depth of their thinking. 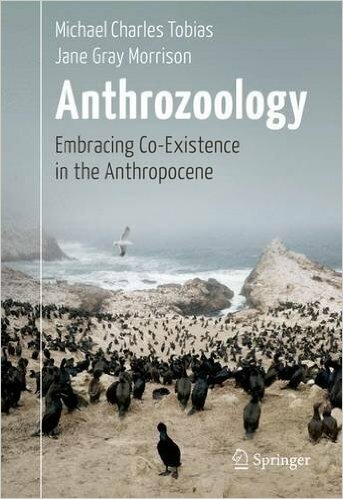 Their most recent book, Anthrozoology: Embracing Co-Existence in the Anthropocene, is a case in point. It focuses on humanity’s relationship with other species from the earliest of time, when human activities first had a measurable impact on the Earth and it’s inhabitants, and forward through the course of the integrated history of humans and other species inhabiting the planet (aka per the authors, “The Others”). If you are familiar with the work of Tobias and Morrison, you would expect a new book by the couple to be thick in description. And this book is, both as etic and emic discourse. I chose to focus on Chapter 2, “Our Conquest of Coevolution?,” and Chapter 11, “A North American Family: The Ecologies of Translation,” because the authors confided in me that they feel these are the book’s most radical chapters. But I also lightly read from other chapters here and there including Chapter 1, which I found useful to grasp the authors’ lexicon of ecological philosophy and animal liberation science, subjects not as familiar to me as they should; and the Coda, which brings their theses full circle. In the course of my read, I encountered head-spinning interpretation of tightly integrated contents ranging from histories and ethics of conquest amply supported by quantifiable data, irreverent musings about shortcomings of normal science, e.g. comparative zoology vis-à-vis reverence for and understanding of animals through aesthetic expression, blunt and passionate ideology, and even delightful, philosophical prose which occasionally bordered on the mindful pleasures of Thoreau or the effective, often anecdotal, writing style of Aldo Leopold and his penchant, like that of the authors for lists, or perhaps even Native American perspectives in literature and history such as those imbued in the affable trickster, coyote. All of which gave me pause on more than one occasion, to look up from my copy of the book, smile, and ponder the book’s spiral structure, which I imagined as something akin to Max’s memorable line in Maurice Sendak’s book, when he “sailed off through the night, and in and out of weeks, and almost over a year, to where the wild things are.”[i] The sectioning of the book, and its lexiconic vocabulary creates that kind of spiraling cadence, which is not only part of the charm of this book, but also an aide to a reader like me not schooled in the science of Anthrozoology. Whereas I occasionally found myself challenged in sections where jargon and rich vocabulary was foreign, I would no sooner spiral out into the next section where familiar language and train of thought made for a connected read. 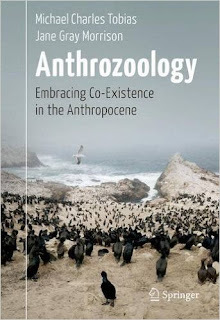 Anthrozoology: Embracing Co-Existence in the Anthropocene is packed with example after example of attitudes, values, behaviors, and practices of human dominance toward animals across and throughout cultural history. The catalogue of examples which Morrison and Tobias present of human inhumanity against animals is encyclopedic and impressive. The book argues that unless humanity liberates itself from biological hegemony, human existence will self-destruct, but also that there is an antidote: communication. In the authors’ own words: “. . . the crucial message that lives and breathes throughout the book: That our love and reverence of other organisms, yes, other species, and our humble efforts to somehow non-invasively engage with them, may be key to solving the crisis of the Anthropocene which, most noticeably, has translated into the Sixth Extinction Spasm in the history of life on earth, [v] a biospheric Holocaust occurring 24/7.” Throughout Anthrozoology, Tobias and Morrison reiterate their concern for the need for communication with other species. In the process, the book’s dire yet hopeful core message establishes that the world of Homo sapiens and Others is full of bifurcated challenges and opportunities. Though Anthrozoology is a book about compassion, hope, and the promise of communication, I for one, felt the scales of my read tip toward pending danger given the pathetic state of current presidential politics. In fact, I confess that there were times while I was reading this book, that I was unable to do so from a hopeful perspective. (When I came across this line comparing humans to “The Others,” for example, it was next to impossible for me to read it without association: “No other species has ever dared to massively behave so foolishly, narcissistically, angrily, so ruthlessly.”[vii] On the other hand, I found the authors’ skill at conveying the sense of joy and mystery from love and understanding of all species to be infectious and up-lifting. Questions about Anthrozoology remain in my mind: Can the authors’ utopian ideals transcend a self-serving world that values short-term gain? From a literary perspective, I wondered about the nature of the author’s collaboration. How do they work? Their voices are unified in the text, but I am curious about their research and writing methods, i.e. who does what? It would be interesting to hear them talk about that in a seminar. In any event, Anthrozoology is a challenging yet informative and very creative book; one that I imagine would engage and stimulate students, among others, in countless, unimaginable ways. David J. Wagner, is the President of David J. Wagner, L.L.C. , a limited liability corporation established in the state of Wisconsin for the principle purpose of producing and managing traveling exhibitions for display at museums and related art, cultural and scientific institutions in North America and abroad. He previously served as a museum director for 20 years, and is an author with a long list of lectures and book signings. He also occasionally serves museums as a guest curator, and as adjunct faculty at colleges and universities.